Robbing indicator, or natural slow build up ? Posted: Tue Aug 29, 2017 9:30 am Post subject: Robbing indicator, or natural slow build up ? An unnoticed small swarm took up residence in my 6 bar bait hive 4-6 weeks ago and I transferred them into a TBH this weekend. Coming and goings had looked normal and certainly were carrying in pollen. On transfer day though there was very little build up - 2bars of <60% comb with a circle of capped brood and some larvae, and a couple of bars of even lesser (and thinner) amount. Very very little to NO stores. Lots of small bees. Could this be a natural part of the cycle - small swarm so relatively few workers bringing in stores to a growing family of as yet non-working bees ? Or is it likely to be robbing ? In the TBH (same location) they are now stopped down to a single 10x12mm entrance and have been fed 1.5kg sugar @2:1 over 3 days. There is a lot of 'returning bees' at 9am this sunny morning - and I wondered if these were robbers, however 90% of them are carrying pollen and get immediate entry. Couple of bees hanging suspiciously about and then managing to enter. Does it sound like they were / are being robbed ? I was going to stop feeding today and then check stores at the weekend - if still empty I was going to assume being robbed. If so, is there anything else I could do to stop it ? If one of you kind people have already written up on 'robbing behaviour' then a link to that would be great. Congrats on baiting the swarm. It sounds like it was probably a small cast swarm. What you have to realise with swarms is that there are priorities for them and with a small swarm their workforce is limited in achieving those tasks. There are 3 main tasks and any generation will probably achieve two of them. Firstly, building comb is a necessity unless they have found a previously occupied cavity which has comb that they can reuse. Building comb is hard work because they need to generate heat to work wax. Nothing else can happen until they have some comb. Next, they need brood to replace the bees from the swarm before they die. Raising that brood requires a lot of work because there are no stores, so it is mostly hand to mouth living for them.... they don't have enough resources to gather excess stores. 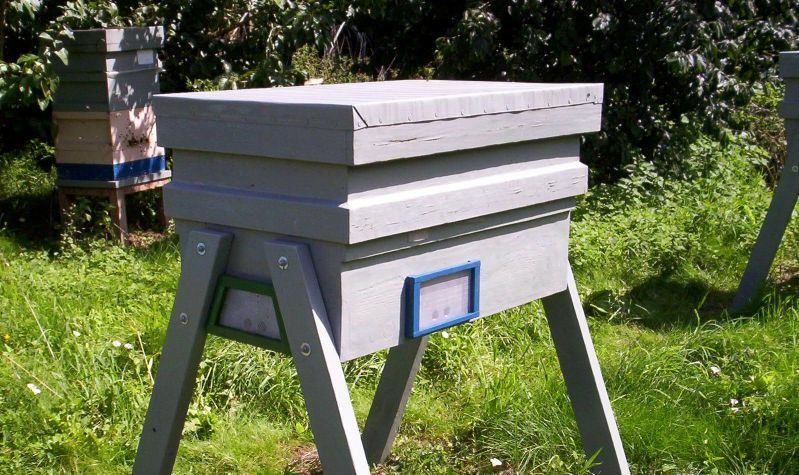 Thirdly, the next generation will hopefully be the ones to gather in the harvest for the winter and lay down stores and also raise the next generation bees which will be the ones to over winter on those stores. So providing some comb in the initial bait box means that they can start raising brood straight away. Or, if you have no comb, providing them with some ready food(thin syrup) will help them to feed the young and mean that they can either build more comb or start laying down stores. 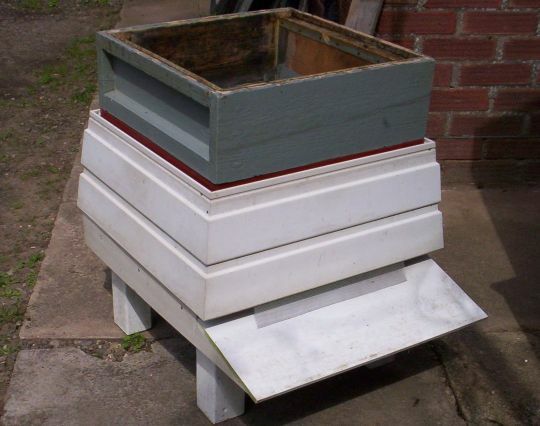 At this stage with your swarm where they have raised that second generation, providing them with thick syrup to lay down as stores will help them get set up for winter. Do not expect them to build much more comb as their numbers are not enough to warrant more comb, but if you can give them some, that will definitely help. Most cast swarms would probably struggle to survive without assistance. What they do though is to start building a nest that may enable another swarm next season to have a better chance. It may appear that I am advocating feeding swarms and in general I am not unless it is apparent they will not survive without assistance..... it sounds like your little colony is in that situation. I would reduce the entrance down even further so that just one bee can pass at a time and perhaps fasten a screen over the entrance to deter any robbers. Reduce the volume down to probably just 4-5 bars and feed as much thick syrup as they will take but do it in small quantities..... a jam jar full every 4-5 days. I prefer little and often for feeding because it reduces the chance of robbing by allowing the bees to safely store the syrup before more arrives and doesn't put too much stress on fragile new comb all at once..... giving the bees a chance to reinforce the comb and brace it to the hive walls if necessary. You will usually notice a significant increase in activity when you start feeding them, just because it gives them a boost, particularly if they are struggling as you describe. The bees with pollen are not robbers. Drones may still be being evicted, so that will appear as a tussle on the doorstep and baby bees doing orientation flights will bob about in front of the entrance, so hopefully robbing is not occurring. Preventing it is infinitely better than trying to stop it once it starts, so reducing the entrance on a weak colony like this is very important. I would probably have left them to overwinter in the bait hive if it could be made sufficiently weather proof enough, but I would not transfer them back now that you have moved them. They will need lots of insulation for such a small colony to survive but I have had one make it through winter on just 3 combs, so they are not totally doomed. Posted: Tue Aug 29, 2017 11:48 am Post subject: Re: Robbing indicator, or natural slow build up ? With a small colony there is always the risk of 'latent robbing' - i.e. bees inviting themselves in and helping themselves to nectar, without a full-blown robbing frenzy taking place. This is a problem I face every year from August onwards in the production of nucleus colonies within a one-yard apiary. Sheets of glass are a waste of time, as are wet sheets, spraying water, and the many other ideas so often suggested. Simple mesh screens, such as these, work flawlessly. Regarding feeding - only do this in the late evening. NEVER during the day. Thanks for the advice as ever. Will fashion a screen and moderate any further feeding. Is this mesh to allow bees through and not wasps? surely bee robbers from other hives would still fit through, or does the mesh have another function? The mesh is bee and wasp proof but there is a gap between it and the hive wall which allows the bees to get in and out under the mesh. 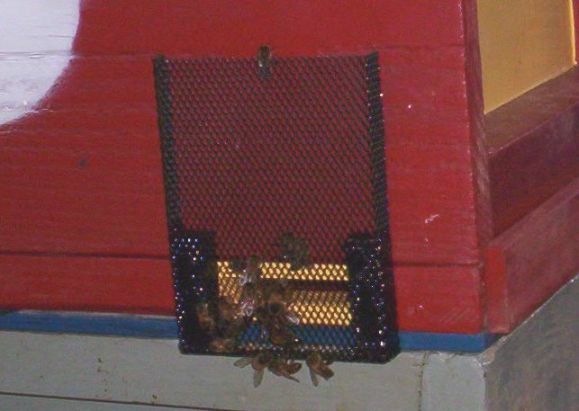 The resident bees learn to route under the mesh but robbers (wasps and other bees) are attracted directly to the entrance holes and are baffled by the mesh. The benefit of mesh over clear plastic is that the hive scent can travel through the mesh and therefore keep robbers centred on the mesh rather than following the waft of honey around the side. I would imagine the deeper the external frame around the mesh, the more effective it will be. The 'home bees' find these screens something of an inconvenience at first, until they learn the route around the mesh (in my case, usually 'over' the mesh) and thus establish a route into the hive - but home bees are in no great hurry and will work at the difficulty until it's solved. And, once enough footprint pheromone has been laid down, even newly-promoted forager bees out for the first time will find their way in and out without any difficulty. When anti-robbing screens are first fitted (i.e. having no pheromone trail to follow), it's incredibly frustrating to watch a bee, laden with huge leg-baskets of pollen perhaps, just keep going around and around and unable to find her way in. There's a natural urge to assist her - but - they all 'figure it out' eventually. Robbers (especially robber scouts), on the other hand, tend to hover over the mesh as near to the entrance as possible. These bees are in the greatest of hurries - they want to get in and out just as quickly as possible in order to avoid detection, capture, and punishment - just like human thieves. They seem to have no inclination at all to 'sit down and figure this thing out' - they just want instant, easy access ... but don't get it. What some guards do is to set-up station on the outside of the mesh, so don't assume that the handful of bees hanging around on the outside of the mesh are necessarily robbers. Should a robber unwisely decide to land on the mesh itself, then a fight with those guards inevitably follows - and then you'll know for sure that the screen is doing it's job. And this one is just a strip of mesh hanging down from the lower edge of a bottom lift, protecting a 2" central slot opening. Access is then via either side, but the principle with all these is exactly the same: mesh being placed over the entrance, with access available a few inches away to either side, or above or below.